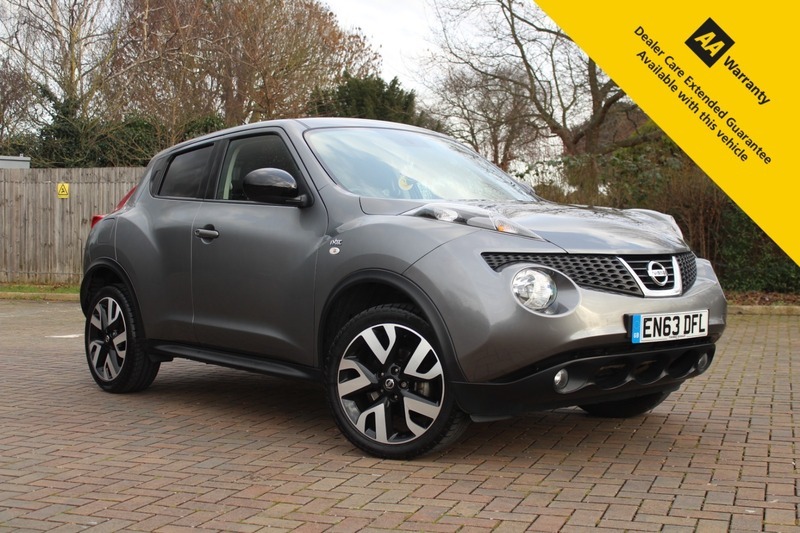 HERE FOR SALE AT LEIGH CARS LTD WE HAVE A SUPERB EXAMPLE OF THE POPULAR NISSAN JUKE SUV 1.6 PETROL. THE N-TEC MODEL LEVEL COMES WITH AN IMPRESSIVE SPECIFICATION LIST INCLUDING SAT NAV, REAR PARKING CAMERA, ELECTRIC WINDOWS & MIRRORS, CLIMATE CONTROL, CRUISE CONTROL, BLUETOOTH CONNECTIVITY, FRONT FOGS, DIAMOND CUT ALLOYS + MUCH MUCH MORE. THIS FINE EXAMPLE COMES IN A STRIKING METALLIC GREY PAINT AND IS IN GREAT CONDITION FOR THE AGE AND THE MILEAGE. THIS CAR COMES WITH A BRAND NEW ADVISORY FREE MOT THAT EXPIRES JANUARY 2020 AND A FAULTLESS FULL SERVICE HISTORY - LAST SERVICES @ 27,306 SEPTEMBER 2018. THIS CAR IS IDEAL FOR A GROWING FAMILY OR MAYBE SOMEONE LOOKING FOR A HIGHER RIDE HEIGHT WITH A MORE COMMANDING DRIVING POSITION. THIS SUV WILL ONLY COST YOU £140 PER YEAR TO TAX AND WILL RETURN YOU AN AVERAGE OF 47.1mpg, SO IS NICE AND ECONOMICAL TO RUN FOR A BIGGER SUV CAR. AS WE ARE AN AA ACCREDITED DEALER, WITH ANY PURCHASE THROUGH LEIGH CARS LTD, YOU WILL ALSO RECEIVE A FREE WARRANTY ALONG WITH 12 MONTHS AA BREAKDOWN ASSISTANCE. WE OFFER VERY COMPETITIVE FINANCE PACKAGES - WHY NOT CHECK OUT OUR FINANCE CALCULATOR ON OUR WEBSITE WHERE YOU CAN TAILOR A PERSONAL QUOTE TO YOURSELF AND EVEN INSTANTLY APPLY FOR FINANCE! WE OFFER PART EXCHANGE AND NATIONWIDE DELIVERY AND WE ALSO OFFER HOME APPOINTMENT SERVICES, SUBJECT TO CONDITIONS. WE ARE RATED 5 STARS BY ALL OF OUR CUSTOMER REVIEWS SO YOU CAN BE ASSURED YOU ARE DEALING WITH A COMPANY YOU CAN TRUST. QUALITY CARS YOU CAN TRUST.